Neslting in the clouds Hotel Shail Shikhar in Pauri Garhwal is blessed with splendid view of snow bound peaks of the majestic Himalayas, pristine valleys & misty rolling hills, meandering rivers dense forests & hospitable people with a rich culture. Hotel Shail Shikhar offers a great view of snow covered Himalayan Peaks like Bander Pooch, Gangotri Group, Kedarnath, Chawkhamba, Neelkanth, Hathiparvat, Nandadevi, Trishul and many high altitude himalayas. 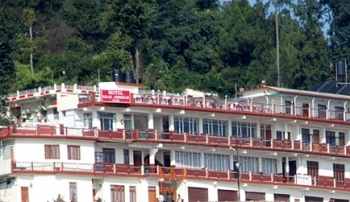 Hotel Shail Shikhar is situated at Pauri, Garhwal, Uttarakhand on the northern slopes of picturesque Kandolia hill ranges of middle Himalayas at the height of 1814 meters above the sea level. Hotel Shail Shikhar offers 14 spacious and tastefully furnished rooms divided into deluxe and semi deluxe. All the rooms have breathtaking views of snow clapped mountains each room is thoughtfully furnished and well decorated to suit need and preference of all kind of guest. Shail Shikhar hotel boast of spacious double rooms with attached bath, 24 hours running hot & cold water, Multi Cusine Restaurant, Conference Hall, Room Service & Car Park. We also take care of Environment by Installing Solar Water Heater System on the roof of Hotel. For the adventurous people, Hotel Shail Shikhar also offers camping facilities with tents and other camping gear. The hotel promise its guests with a fine dining experience the in house multi cuisine restaurant of Hotel Shail Shikhar savors one of the best culinary delights and serves spectacular treats for its guests to relish and pamper their hungry taste buds. The restaurant offers Indian, Chinese, Tandoori, Vegetarian-Non Vegetarian cuisines. - Laundry, Dry Cleaning, Fax Services, Hot water bags, sightseeing tour (on request) etc. BY ROAD: Pauri is well connected by road with major cities of the region like, Dehradun, Rishikesh, Haridwar, Delhi. Tehri-Moradabad State Highway connects major destinations of the Pauri District like, Lansdowne, Kotdwar and Srinagar.